Ever heard of kangaroo apple fruit? You may not have unless you were born down under. Kangaroo apple plants are native to Australia and New Zealand. So what is a kangaroo apple? Read on to learn more. What is a Kangaroo Apple? Kangaroo apple plants are unrelated to apples, although they do bear fruit. A member of the Solanaceae family, Solanum aviculare is also sometimes referred to as New Zealand nightshade, giving us a clue as to the characteristics of the fruit. Nightshade, another Solanaceae member, is poisonous like many other Solanacea members. Many of them contain potent alkaloids that may be toxic although we eat some of these “toxic” foods – such as potatoes and tomatoes. The same can be said of kangaroo apple fruit. It is toxic when it is unripe. Kangaroo apple plants are bushy shrubs that grow between 3-10 feet in height covered in flamboyant purple blossoms that bloom profusely through the spring and summer. The flowers are followed by green fruit that matures and ripens to yellow, then deep orange. The fruit at maturity is 1-2 inches long, oval, orange with juicy pulp filled with many tiny seeds. If you are thinking about growing kangaroo apple, keep in mind the plant is subtropical and does not tolerate more than the briefest freeze. In its native habitat, kangaroo apple can be found in and around sea bird nesting sites, in open shrub land, and along forest fringes. Interested? So how does one go about propagating kangaroo apple? Kangaroo apple growing occurs via seed or hardwood cuttings. The seeds are difficult but not impossible to come by. They take several weeks to germinate. An evergreen, kangaroo apple is suited to USDA hardiness zones 8-11. 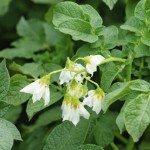 It can be grown in sandy, loamy or clay laden soils provided they are well draining. Plant seeds in full sun to part shade. It thrives in moist, not wet, soil but will tolerate some drying out. If container grown, the plant can be brought inside if cold snaps are forecast. If you do want to eat the fruit, to be safe, wait until they have fallen from the plant. That way they will be completely ripe. Also, the birds like the fruit, so the potential for invasiveness is there. Read more articles about Kangaroo Apple.